When the protuberances on the edge of flowers were first noticed by hybridizers they were considered deformities and the stock destroyed. When some first started calling it lace the attitude changed and soon the idea of a laced flower became popular and mainstream and perhaps should no longer be classes as a novelty iris. 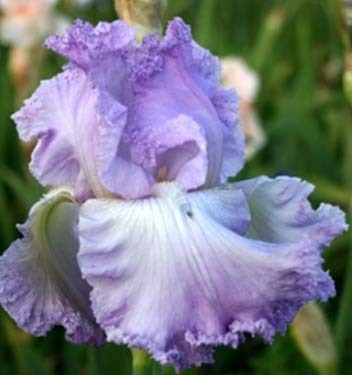 We are attempting to develop a list below of Irises with this trait. 'Grand Waltz' to the right has especially fine lacing, while others in the list note lace in their descriptions but in some cases may be barely discernable. Please add any that have been missed by commenting in the comment box. When we have assembled more images we can create a wonderful image gallery.